When I claimed that I was determined to find joy in cleaning my house, I had some doubts. I mean … you know me, right? 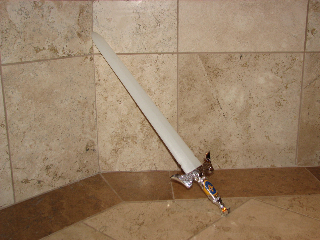 Swords don’t belong in the bathroom, I thought to myself. But it made me smile to think that my son must have been slaying a vicious dragon before he brushed his teeth that morning. As I made my way around the house picking up the wreckage from two weeks of my family having been trapped indoors by the flu, I found plenty of reminders of my kids’ incredible imaginations. The remains of a shipwrecked pirate ship around the dining room table. The outcast works of art that did not make the cut for the gallery they curated in the living room. Dried-out Play-Doh sculptures of WALL-E that they designed themselves–on display on the kitchen counter. Somewhere, I stumbled across this faux pink diamond gemstone ring … when I was a little girl, my Grammie took me to the store and there were these dollar-store quality rings on the counter by the cash register. She and I picked out matching rings, and I squeezed the fake gold metal to fit my little finger. Years later, when she passed away, I found her matching ring in her jewelry box. I kept it with mine, and have had the two matching rings ever since. A few months ago, my daughter discovered them. So now she has the little one and I have my Grammie’s ring. They’re just these cheap little fake rings. But my daughter loves it when we match. So, I slid the ring on my finger and continued my cleaning adventure. Later, as we were all huddled together watching the snow fall outside, my daughter said “I know what will warm us up … a Tea Party!” My son agreed, so I brewed a pot of peppermint tea, and poured us each a cuppa in the Bone China tea cups she received for Christmas. They remind me of my other Grandmother who emigrated from England so many years ago. She gave me a tea-cup and saucer just like these ones when I was a little girl. She’s getting up there in years and desperately needs a visit from me and these sweet little angels. At the end of the day, my house was clean. And, I have to admit … I rather enjoyed it. Be honest … you didn’t think I could do it, did you? This entry was posted in The Challenge. Bookmark the permalink. I have to admit: I was waiting for the *kaboom* (my brain turns everything into a cartoon). What a lovely time of rediscovery. Hope a trip to Grammie’s makes its way into the plans.